Rahat Loukoum: the non-export Serge Lutens that spawned a thousand pilgrimages to Paris. After my very own Paris pilgrimage, I am prepared to offer my (extremely important) thoughts on this cult fragrance. Rahat Loukoum is a very pretty cherry/almond fragrance. It is intensely sweet, but still maintains a delicate touch. I know that “very pretty” is not exactly a ringing endorsement, but I stand by it. Pardon the sacrilege, but while Rahat Loukoum is certainly an attractive fragrance, I honestly do not find it to be enough of an improvement on my $29 bottle of Carol’s Daughter Almond Cookie to justify the $130 price increase. Rahat Loukoum also degenerates into a bit of a sugary mess after a few hours. Again, while this sugary mess still smells good, it’s not the sort of thing for which one pays $160. Perhaps in a few years, as my nose becomes more sophisticated, I will be able to detect more of Rahat Loukoum’s subtleties. But until then, my recommendation is that you save yourself a $3000 plane ticket and just make a pilgrimage to your local Sephora for some Almond Cookie instead. I have it, love and adore it! I did not have to travel to Paris, a friend brought it home to me in LA! That’s the way to do it! 🙂 I really did enjoy RL, and if it had been the first cherry scent that I had tried I think that I would have been quite taken with it. Just to play devil’s advocate here, how easy is it to use cherry and almond in a fragrance and come up with something different than pretty? Very hard! These notes by definition will lead you into something childish. White I like about Rahat Loukoum is that although it could suicide for diabetics it manages to remain transparent. 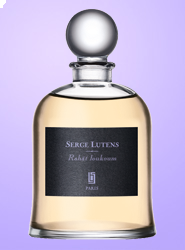 And transparent for a Serge Lutens fragrance is something very commendable. I would definitely agree with your devil’s advocating, and would go even further: even if you can achieve a non-pretty cherry-almond fragrance, it may not be all that successful. 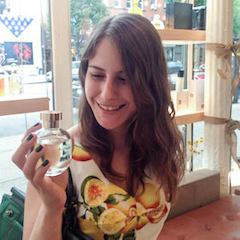 I believe that Serge’s weirder almond scent, Louve, was not very well-received by most perfume lovers, although I personally like it. Hiacint, how funny about the name! So I suppose Romanians are not big turkish delight eaters, then? 🙂 Lutens seems to have eyes only for Morocco. I must admit that I’ve never had the pleasure (?) of trying turkish delight. I only know it as the tempting sweet in The Lion, The Witch and The Wardrobe. What is your language MoS??? I love languages and am always very curious about them. Hmmm. I thought for sure that I had tried this one, but I must be confusing it with Louvre (gagalicious), since I have not been to Paris. Only slightly off track: at Sephora I saw the Carol’s Daughter stuff, but I didnt try it, because I couldn’t remember where it was I’d heard it praised— was it you? Well, next time I’m there, I’m going to get me a sample! My native language is Greek. Yes, you must be thinking of Louve. They are both almond scents but smell very different. I’ve definitely recommended Almond Cookie on here! Om nom nom. You can’t go wrong, it’s so cheap.